Project Boon’s 7th Annual Eat & Be Well Pre-Thanksgiving feast serves up free fun, food, haircuts, much-needed health services and eye exams to Inland Empire’s under-served populations. 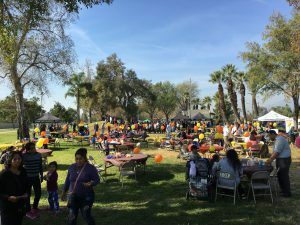 On November 21st, the day before Thanksgiving, at Seville Park in Fontana beginning at 11 AM, Eat & Be Well will enter its 7th consecutive year of bringing the Inland Empire community together for the common good. The annual Project Boon event draws hundreds if not thousands of people together for a fun-filled day of feasting, entertainment, and games for the kids. Most importantly, it helps people in need stretch their budgets while still enjoying all that the season has to offer. Though providing a free bountiful meal to those in need is a reward in and of itself, Eat & Be Well also serves up health and wellness by partnering with both non-profit and for-profit businesses that have programs to help the under-served. In past years, this has included free flu shots from Walgreens, haircuts from local stylists and bus passes from Omnitrans to help people without transportation get to and from the event. To serve up to 2500 attendees, Eat & Be Well relies on donations to cover costs and food items. You can contribute or sign up to volunteer at Eat & Be Well’s website or drop off turkeys and/or canned food such as sweet potatoes, corn, green beans, gravy, and cranberry sauce at The Hitch Burger Grill in Rancho Cucamonga. Visit our site for a complete list of items needed. 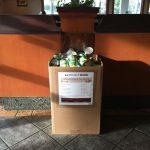 Any excess food will be donated to support other food banks and holiday based events. For more information on how to volunteer, donate, sponsor, or attend, visit eatbewell.org. For additional commentary from Project Boon or to schedule an interview with cofounder Chris Suchánek, please contact David Velasquez at (951) 305-3038 or email d.velasquez@firm-media.com.